Okay, so the plans was to stop my chicken obsession. It's still the plan but it will have flaws since I found gorgeous George on Facebook and feel an urge to draw and paint him. 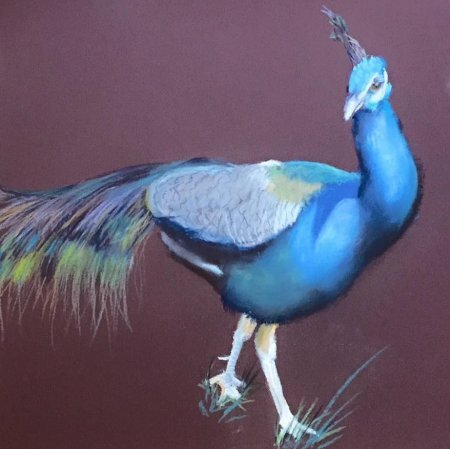 But I have stepped sideways with the peacock which strangely sold despite not being completed yet - a new achievement. My plans for this year are landscape painting - it's been on my mind for a long time. I adore landscape artists but being a minimalist they just overwhelm me. All the details and how to fit my style with that just seems impossible. But if you don't try you never find out. A plein air workshop in May has been booked and I'm already excited about this.